Online fashion shoppers today have more choices than ever, and websites are trying their best to create a niche that sets them apart from the rest and gain a loyal following. Launched in 2015, Aditya Birla Group’s abof has chosen a very versatile route to become a household name. What makes abof stand out from other Indian fashion websites is that they use smart technologies and a possess a deep understanding of how content works, to let customers experience an immersive shopping experience that starts from customized feedback to finding the perfect fit. One of the worst experiences of online shopping is ending up with an ill-fitting garment. Size charts are not comprehensive enough to cover the nuances of the different styles, looks and cuts that the latest fashion offers. To take this problem out of the equation, abof has introduced a revolutionary virtual reality powered 3D trial room feature. This feature has been rolled out for a large segment of the clothes on the website. All you need to do is try out these specially captured images on a virtual model or avatar. The avatar’s body measurements can be tweaked to represent your exact numbers. You can also try out layered outfits with this feature. This 3D trial room feature is powered by Metail and is the closest experience to a real life change room in the virtual world. What most experts believe about visual search is that it adds more precision to active searches by users. Abof’s visual search feature is powered by Cloud Sight; a technology which belongs to the US based company CamFind. With this feature, you can click a picture of a garment you like and upload it on the abof app to check if it is available on the site. Visual search is quicker and much more accurate compared to trying to describe a certain pattern or style via the text search. Every-day delivery is one of the hallmarks of the abof sales model. You no longer have to unnecessarily wait till Monday for your product as it arrives on the weekend itself as Sunday deliveries help in reducing the transfer time. When Aditya Birla Group launched abof in 2015, the aim was clear – to create quality fashion content along with the shopping platform. Most fashion content in Indian shopping websites is generic in nature, focused more on discounts and sales, while ignoring the personal aesthetics part and the individual’s taste. With a smart back-end technology, abof curates content to suit the consumer’s taste and this one-of-a-kind personalized feed features style tips and product recommendations. Apart from these, abof’s content covers international style trends and news related to fashion and celebs, all picked by the experts. At the end of the day, customer experience on the site is crucial to increasing a market share. Abof’s approach is through personalized experiences and powerful shopping tools that reduce the chances of returns. 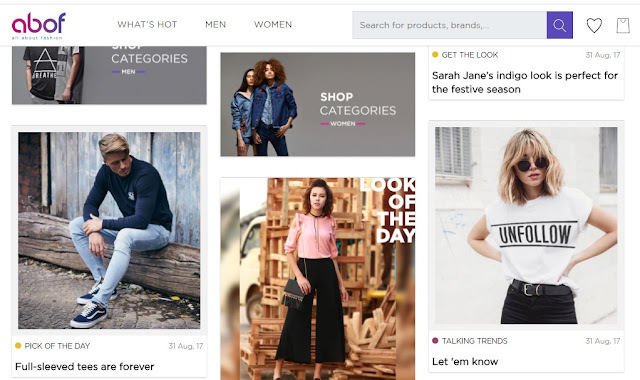 By providing a platform for discovering new looks along with a premium shopping experience, many customers are coming back and choosing the site as their main fashion provider. 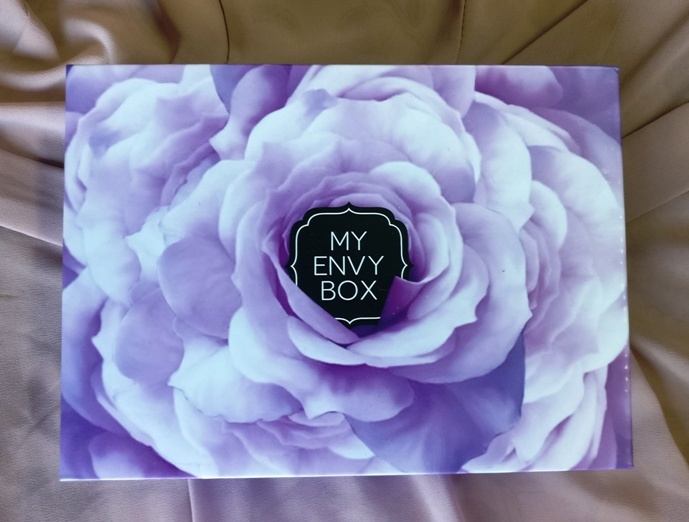 The August Edition of My Envy Box came in a pretty shade of purple filled with skincare goodies and one lipstick. The best part about it is that most of them were full sized products! 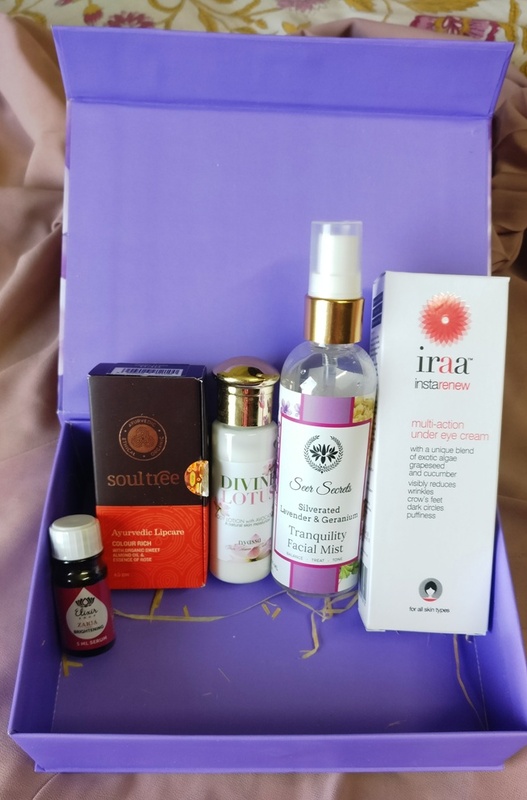 I really like with this month's box as it has a mix of good products that are useful for everybody. 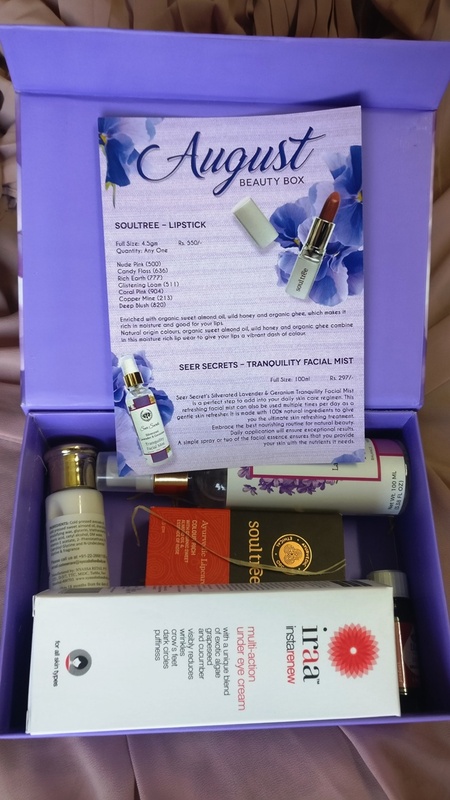 Seer Secrets Tranquility Facial Mist (Rs 297 for 100ml) - Seer Secret's Silverated Lavender and Geranium Tranquility Facial Mist is a refreshing facial mist can also be used multiple times per day as a gentle skin refresher. It is made with 100% natural ingredients to give your skin a nice and refreshing treatment. A simple spray or two of the facial essence ensures that you provide your skin with the nutrients it needs. I've used this at times when I wanted some hydration but did not want to apply any cream or serum. A nice and reasonable product which is quite good for hot summer days and humid climates. 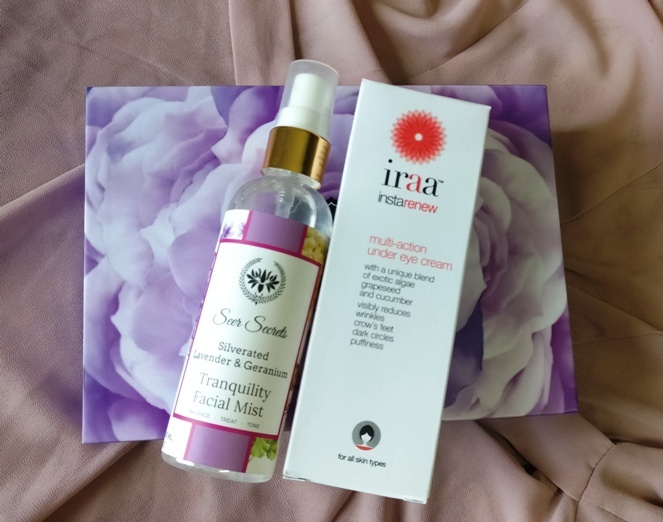 Iraa Eye Serum (Rs 490 for 20gm) - Iraa Instarenew Multi Action Under Eye Cream is a night cream with unique blend of Exotic Algae, Grapeseed, Cucumber and Shea Butter. Enriched with Vitamin E and anti-ageing properties. This cream helps in reducing puffiness, fine lines, reduce wrinkles and dark circles. This fast absorbing, fragrance free formula is designed to soothe the delicate eye area leaving the skin moisturised and giving you a renewed, youthful look. Nyasa Divine Lotus Body Lotion (Rs 105 for 35ml) - Nyassa's Divine Lotus Body Lotion contains Lotus Extracts and Wheatgerm Oil. Lotus Extract is an effective natural moisturizer and also acts as a toning agent making your skin taut and younger looking. High in Vitamin E and protein, Wheatgerm Oil helps promote new skin cell growth, making for younger looking skin. It leaves your skin feeling wonderfully soft, smooth and nourished. This small sample is useful for traveling. 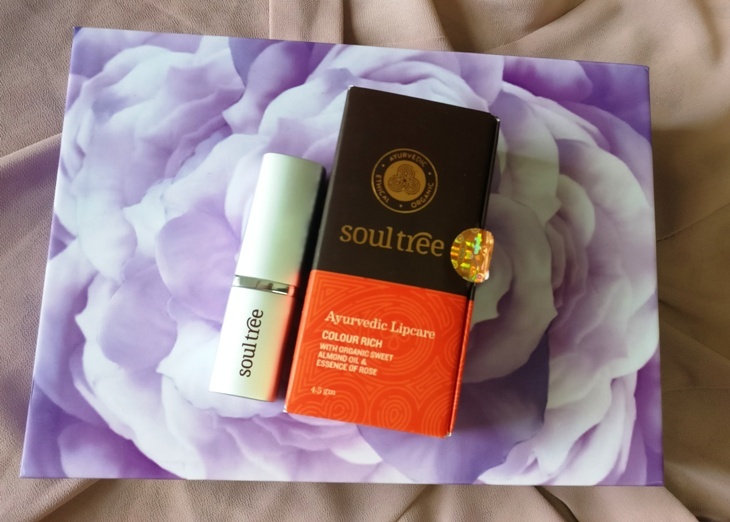 Soultree Lipstick (Price Rs 550) - This is an organic, paraben free lipstick which is enriched with organic sweet almond oil,wild honey and organic ghee, which makes it rich in moisture and good for your lips. Natural origin colours, organic sweet almond oil, wild honey and organic ghee ) combine in this moisture rich lip wear. The shade I got is Candy Floss which is a pretty pink color. 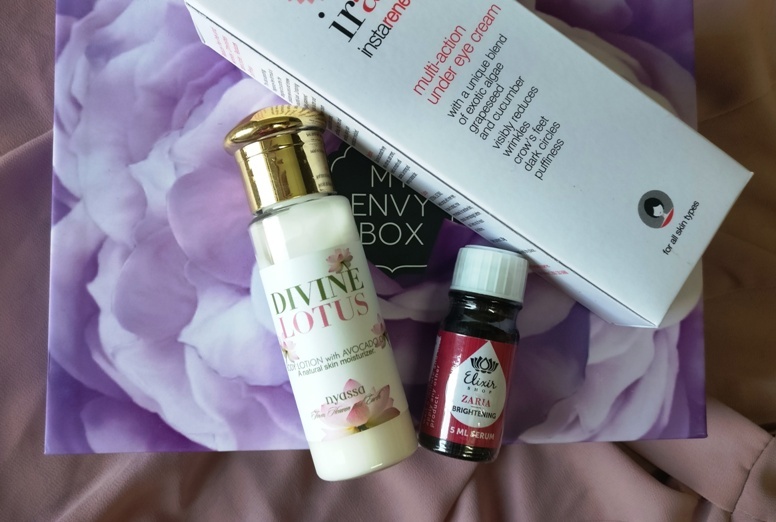 Priced at Rs 850, My Envy Box is quite reasonable and is fantastic value for money as you always get products worth way more and I've always recommended it to all my friends and readers. Who doesn't love lace? Originally made of linen, silk, gold or silver threads, this delicate fabric has been around for centuries and can now be made from a variety of fibers such as nylon, polyester, linen, wool, cotton, silk and rayon. 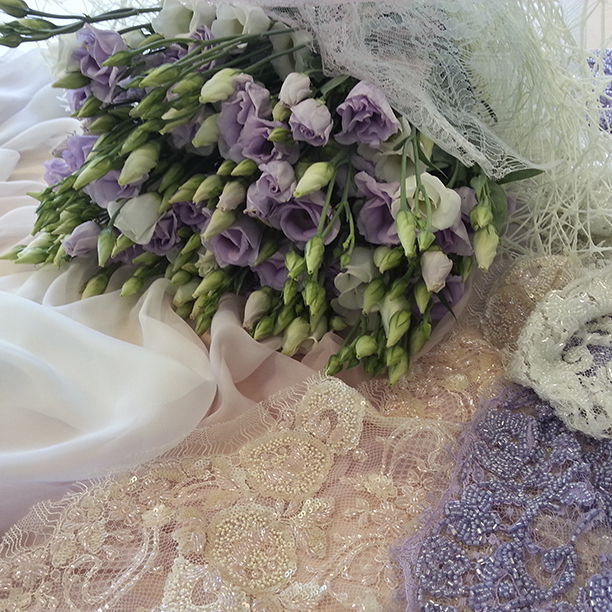 The only difference is that while lace was used to decorate everything from dresses to door knobs in the 17th century, today it can be seen primarily used in bridal gowns and lingerie. 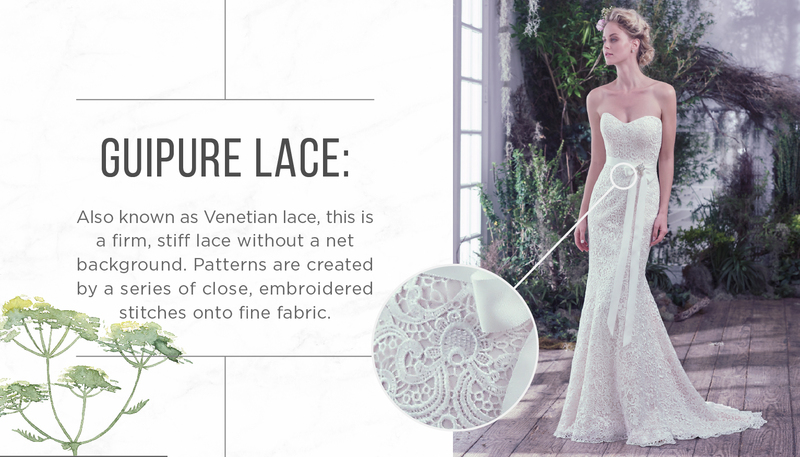 Because of the way lace can transition from ethereal and romantic to lush and opulent, it’s the perfect fabric for a wedding dress. And the fact that it looks amazing in white doesn't hurt either. 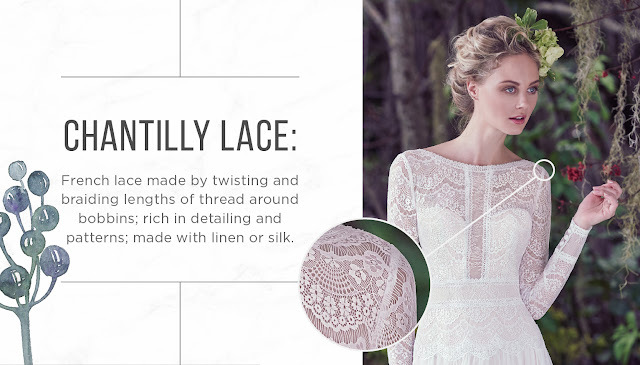 You would be surprised to know that there are numerous types of lace and each has a specific origin and history. Let me tell you about a few of them. Alençon lace or point d'Alençon lace was first made in France in the 16th century, and is renowned for its fine netting ground, corded outlined floral patterns, and heavenly detailing. 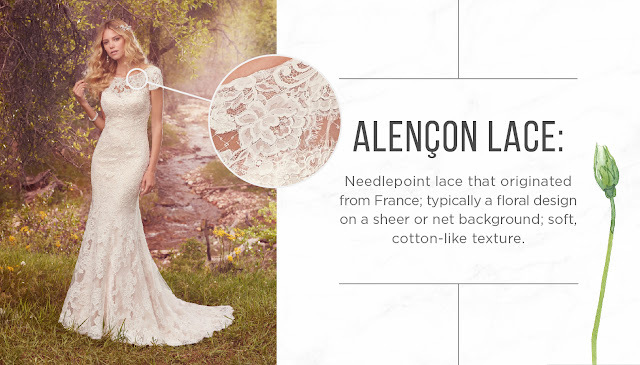 Alençon lace is superlative as trim for wedding gowns and bridal veils and consists of a floral design on a sheer or net background and has a soft, cotton-like texture. Possibly the best known type of wedding dress fabric, Chantilly lace or Galloon Lace, as it can be known, is very fine and delicate and is made on a lightweight hexagonal mesh background. The motifs are sometimes outlined in a heavier silky thread or exhibit shading effects and usually have doubled scalloped edges. Guipire lace is also known as Venetian lace and is a firm, stiff lace without a net background. Patterns are created by a series of close, embroidered stitches onto fine fabric. Embroidered Lace: Delicate patterns tightly stitched onto an illusion base, forming the appearance of an applique. 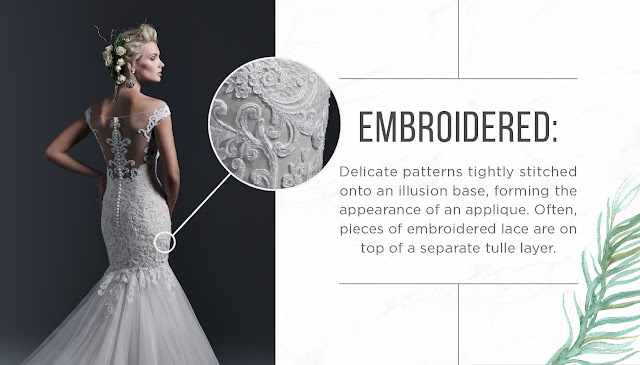 Often, pieces of embroidered lace are on top of a separate tulle layer. Bet you didn't know that there was so much variety and history behind this iconic fabric. Thanks to its intricate construction and romantic floral and geometric details, lace looks fresh season after season, and this is why it has been favored by designers year after year.